Edward Aldrich Hand Signed and Numbered Limited Edition Giclee:"Intent"
Edition: S/N Limited Edition Giclee on Paper and Canvas with COA. Image size: 24" x 20" , 30" x 24 and 48" x 40"
About the Artist: Aldrich creates his oil paintings on masonite in a big open studio which is part of his home in a western suburb of Denver. Several layers of glazing convey texture and gives the colors a brilliant depth. Rocks are a passion of his. " I just love rocks. �they have as much character as any animal. They are a wonderful complement to animals." Reproducing the intricacies of various textures was a challenge that Aldrich feels he has accomplished.Portraits are Aldrich's favorites because they focus the viewer's attention and allow the artist to bring out the character of the animal. 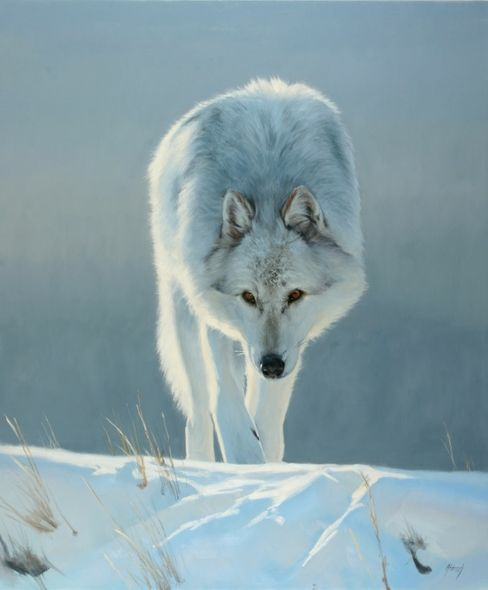 Much of his process has involved determination and experimentation, though he learned some of the techniques at the Rhode Island School of Design (1983-87), attended Master Classes with Robert Bateman in British Columbia and has been to Africa several times to "see" the big cats in their element. No thank you, I just want the 24x20 unframed SN Giclee print.